In year 5, we visited Abbey House Museum to learn more about life in Victorian Britain. We acted as detectives and visited different locations in the Victorian streets to solve a murder mystery. It was lots of fun! Year 5 had great fun when we attended a workshop called 'Rewind to Easter' at Moortown Baptist Church. We took part in a quiz and interviewed characters from the Easter story. Each child also planted a seed and decorated a flower pot, as we thought more about the importance of new life at Easter. Year 5's assembly was all about E-safety and how to stay safe online. They told the rest of the school and the parents about the SMART Rules and how we use these to stay safe. As part of our science work on the Water Cycle year 5 had the opportunity to go to the Education Centre at Headingley Treatment Works on Wednesday 28th November 2018. The children took part in a workshop on linking water and the developing world, focussing on Ethiopia. We were taken on a tour of the water works, learning how water is cleaned. Year 5 had the opportunity to go to Leeds City Museum for an Ancient Greek workshop on Wednesday 9th December 2018. They spent the morning being transported to Ancient Greece and was able to handle surviving pottery and riches, make a theatre mask, ‘whack’ a coin and handle mysterious objects. It was a fun and memorable experience. Class 5 lead their assembly in Spanish. The children shared their Spanish vocabulary on numbers, colours and greetings and could even tell the story of The Enormous Turnip all in Spanish! The children really enjoyed flamenco dancing and singing a Spanish song. Class 5 visited the Leeds City Museum for an Ancient Greek Workshop. They explored the gallery, learning about the various exhibits, then prepared presentations about what they had discovered. Back in the classroom they handled real artefacts and reflected on their uses in Ancient Greek times. The children also made a coin, as well as doing sketches and rubbings of original Greek coins. The children were fantastic and we had a super day. As part of their Earth and Space topic, year 5 have been very creative, producing 3D models of the Solar System as part of their learning logs. As part of International week, class 5 were learning about life in Japan. The children had a tasting session where we used chopsticks to try Japanese noodles. Most of us thought they were really tasty! We also found out about the importance of Japanese table manners. Class 5 have been learning about 'Earth and Space' for their science topic and the 'Ancient Greeks' in history. To bring these topics alive we had the opportunity to have the ' Stardome Mobile Planetarium' in school. This is a dome which projects 360'. Martin Lunn MBE, who was given his MBE for services to Astronomy and Education, gave us presentations on Earth and Space, constellations and Ancient Greek Myths and Legends. This was a fantastic opportunity for the children to further extend their topic work and learn in a unique way. Class 5 visited Moortown Baptist Church to participate in a 'Rewind to Easter' workshop. The children played games, enjoyed some fantastic acting and asked some excellent questions. They also decorated a plant pot and planted seeds, which symbolised the new life of Jesus's resurrection at Easter. It was lots of fun! 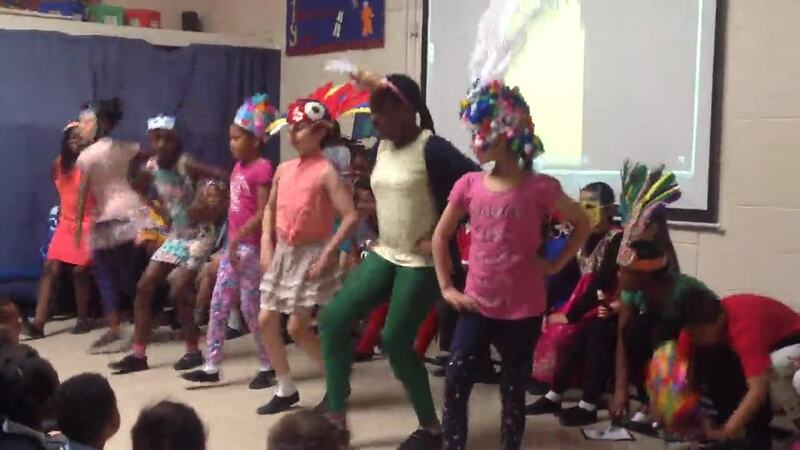 Class 5 performed their assembly yesterday on the theme of Florence Nightingale and Mary Seacole. They compared and contrasted the two women's lives, performed a poem and sang beautifully! They captured how influential these women truly were. Year 5's assembly was about the myth 'Pandora's box'. The children performed beautifully and the parents were very impressed. Today the children in Class 5 have had a fantastic experience in the Stardome Planetarium. Mr Lunn took the children on a journey exploring constellations and their Ancient Greek Myths. They were able to view photographs from satellites and learn from Mr Lunn's wealth of Astronomical knowledge and experience. Meroan states, "I will always remember that Venus rotates the opposite way and the days are longer than the years!" The children had a brilliant time learning skipping skills last week, they even learnt to do a criss cross, which they have been practicing in the playground since. Class 5 have been doing a topic all about Brazil. 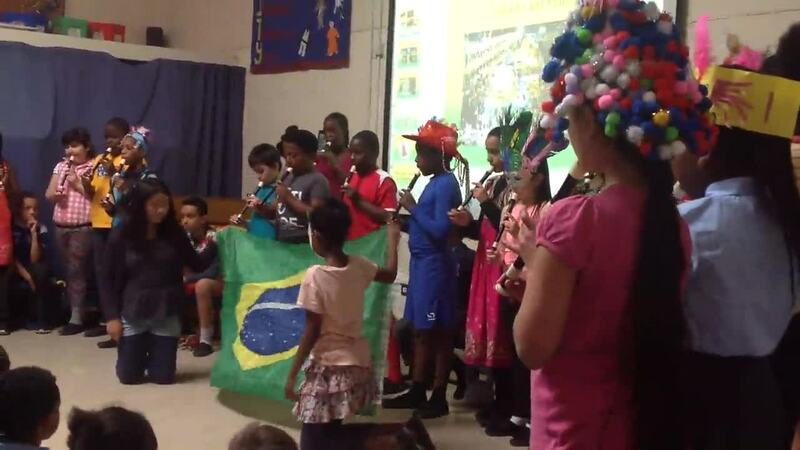 For their assembly, the children presented facts and information about all aspects of Brazil, from the Amazon Rainforest to football, to the 2016 Rio Olympics, plus much more. The children performed a Samba (see below) in celebration of the Rio Carnival and played a Samba tune on their recorders (see below). To conclude the children said The Lord's Prayer in Portuguese. The children have been working really hard and have learnt to play Ebony and Ivory! Year 5 enjoyed a fantastic 'Rewind to Easter' workshop at Moortown Baptist Church. The Easter story was brought to life through story-telling, quizzes and a multi-media presentation. Each child also decorated a plant pot and planted seeds, to reflect the 'new life' of the Easter story. Class 5 enjoyed a fantastic poetry masterclass led by David Harmer. We initially wrote individual nonsense poems about tables. We also wrote some descriptive animal poems and finally produced a class composition about a visiting UFO! We performed our UFO poem to the rest of the school in our celebration assembly at the end of the school day. What a memorable day! Class 5 enjoyed performing their assembly based on The Victorians and Oliver Twist. Lots of parents came along and thoroughly enjoyed the assembly, especially the beautiful singing. In year 5, we recently visited Leeds City Museum as part of our topic learning about the Ancient Greeks. We had great fun exploring the museum and learning lots of interesting facts. We placed events into chronological order, practised making Ancient Greek coins, investigated artefacts and made our own masks. We had a fantastic time! The children in Class 5 have had a fantastic week learning all about Japan. They have made noodles and wrote instructions on how to make them. They have produced information booklets on Japan and Carp kites to celebrate Children’s Day. The class showed great resilience when making origami animals as it was rather tricky. To celebrate the close of International week the children came in traditional clothes and showed their fan dance to parents. This term Class 5 have been learning all about our Solar System. They learnt the names and order of all the planets and even made these amazing Solar System Models at home - they were all fantastic!